On 19-20 April, 2012, Prof. Chistian Madritsch, Engineering and Information Technologies Faculty, Carinthia University of Applied Sciences, Austria, visited the PetrSU. 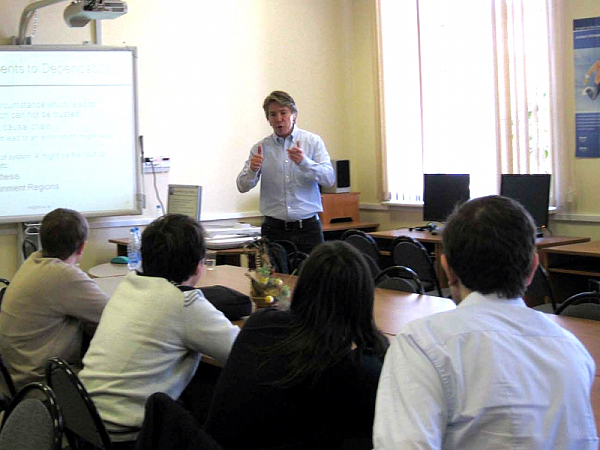 The researcher has delivered the lectures on the real time systems for students of the Mathematics Faculty. Special attention was focused on examples of applications sensitive to safety, prediction of systems reliability, MISRA and JSF security standards. Also Prof. Madritsch had a meeting with the staff of the International Cooperation Department, PetrSU. Possibilities of holding international information technologies schools/workshops and other opportunities for academic exchanges were discussed at the meeting.